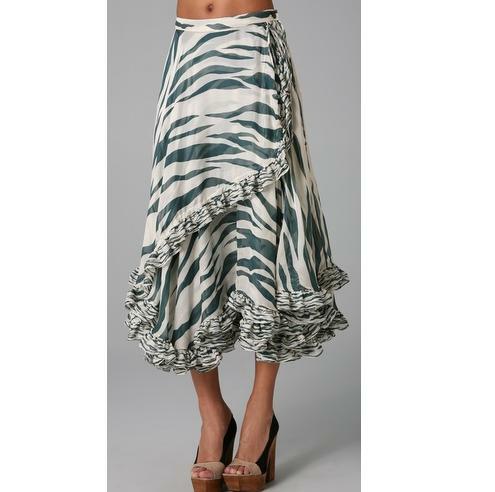 This Zebra print silk-chiffon skirt features ruffled edges at the wrapped overlay and at the asymmetrical hem. Drawstrings at sides. Single-button closure at left side. Double-layered. * Fabrication: Animal print Silk chiffon. SUNO was launched in 2008 by Max Osterweis after he spent more than a decade collecting vintage textiles in Kenya. The overflowing natural resources, talent, and good will in Kenya inspired Max to use his collected fabrics to start a company that treats workers fairly and showcases the country’s artistry, affecting positive social and economic change. SUNO shoes and clothing are designed in NYC and produced through partnerships with ethically responsible workshops in Kenya and India.